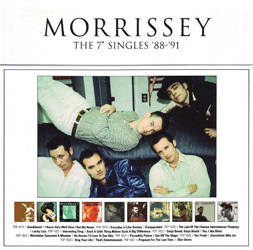 The box set contains Morrissey's first ten 7" singles as released by EMI in the UK: "Suedehead", "Everyday Is Like Sunday", "The Last Of The Famous International Playboys", "Interesting Drug", "Ouija Board, Ouija Board", "November Spawned A Monster", "Piccadilly Palare", "Our Frank", "Sing Your Life" and "Pregnant For The Last Time". Click on titles above for more information about the original releases and their respective artwork. A second box set of 7" singles, this one covering the years 1991-1995 was released the same day. 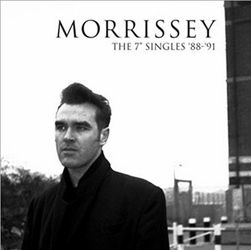 For more information, see "The 7" Singles '91-'95". Similar box sets of cd-singles instead of 7" singles were released in 2000. For more information, see "The CD-Singles 88-91" box set and "The CD-Singles 91-95" box set. UK: This release was promoted via the same 3-cd-r set used to promote the "HMV/Parlophone Singles '88-'95" 3-cd compilation.